"Doorway to an Enlightened World," which opens March 19 at the Michael C. Carlos Museum, presents Tibetan Buddhist art objects within their sacred context. Photo courtesy of The Freer Gallery of Art and Arthur M. Sackler Gallery, Smithsonian Institution. From The Alice S. Kandell Collection. Emory's annual Tibet Week, set for March 21-26, features a full slate of art exhibits, discussions, meditation and other activities that illuminate both the Tibetan tradition and its impact on modern society. "For 15 years, the annual Tibet Week at Emory has provided an opportunity to celebrate Tibetan culture and Emory's unique relationship to His Holiness the Dalai Lama and the Tibetan people, as well as to highlight the innovative and vibrant programs in which we collaborate," notes Lobsang Tenzin Negi, the director of the Emory-Tibet Partnership. The week's events are heralded by the debut of the exhibition "Doorway to an Enlightened World: The Tibetan Shrine from the Alice S. Kandell Collection," which opens Saturday, March 19, at the Michael C. Carlos Museum. The objects in this collection of Tibetan Buddhist art will be displayed within their sacred context, regarded as a "doorway" into a higher world. The Dalai Lama has blessed many of the objects within the shrine. "Viewing Tibetan art objects arranged in a shrine is a fundamentally different experience from seeing each object individually," explains Sara McClintock, associate professor of religion. "With the shrine, the viewer has the opportunity to imagine what it might be like to be a practicing Buddhist in the Himalayas." Highlights of the exhibit, which will be on display through Nov. 27, include large, gilt-bronze Buddhas and bodhisattvas dating from the 15th through the 18th centuries; a Mongolian silver Buddha with seashell and coral adornments; a gilded bronze of the goddess Tara with a gem-encrusted crown; and jewelry, attributes, and thangkas framed within their original silk brocade and with the original finials. The Tibetan shrine "is a beautiful centerpiece of Tibet Week that helps to contextualize the other activities," says Carol Beck, assistant director of the Emory-Tibet Partnership. In addition to the opening of the Tibetan shrine exhibit, Tibet Week features a variety of demonstrations and public discussions. The mandala sand painting live exhibition and meditation sessions, familiar to participants in previous years, will all take place in the exhibition galleries on Level 3 of the Carlos Museum unless otherwise noted. All other events will be held in the Carlos Museum Reception Hall unless otherwise noted. Tibet Week's opening ceremony and shrine consecration is Monday, March 21, at noon and will be conducted by Lobsang Tenzin Negi and the monks of Drepung Loseling Monastery. The live exhibition of the mandala sand painting begins that day at 1 p.m. and continues until 5 p.m., then takes place daily through Friday, March 25, from 10 a.m. to 5 p.m. The Green Tara goddess is the subject of this year's mandala sand painting. On Saturday, March 26, after speaking with the Drepung Loseling monks about the imagery in the Green Tara mandala, adults and children can try their hand with Tibetan chak-purs and colored sand to create a sand painting. This activity is free for Carlos Museum members; $10 for non-member adults, $8 for children 6-16 and free for children 5 and under. The fee includes admission to the museum and the exhibition "Doorway to an Enlightened World." Registration is required. New this year is a live exhibition of Tibetan wood carving on Tuesday, March 22, and Wednesday, March 23, from 1 p.m. to 4 p.m. Master woodcarver Geshe Tsering Phuntsok will demonstrate traditional carving techniques to help visitors to the Tibetan shrine appreciate the elaborately carved and painted furniture in it. Tibet Week features daily talks and panel discussions on a variety of topics. 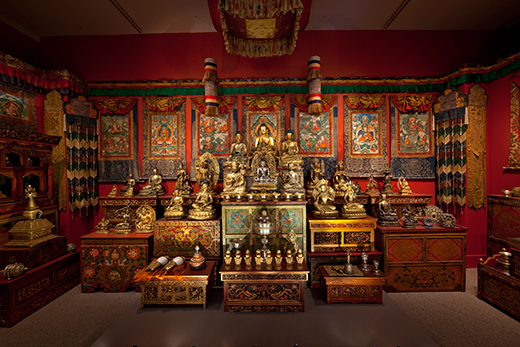 "A Collecting Conversation: 'Doorway to an Enlightened World: The Tibetan Shrine from the Alice S. Kandell Collection'" will feature Kandell in conversation with Joyce Flueckiger, professor of religion and ethnographer of religious practices. Kandell, whose collections comprise the Tibet shrine exhibit, will share her passion for preserving Tibetan sacred art. The conversation is Monday, March 21, at 7:30 p.m.
"This shrine is a unique exhibit in that it provides a visual, ritual context for many specific items; that is, it is a collection of items that appear in spatial relationship one to the other, rather than them appearing individually in exhibit cases," says Flueckiger. "I hope to engage Dr. Kandell in conversation about what is created when these items appear together, as a 'whole,' if you will, rather than singly. "Usually when I teach about altars, we look at events and relationships of both with humans and deities that are marked through individual items and their placement," she says. "However, this altar is slightly different, since it is one that has been created for display rather than worship by an individual family. It may tell a different story: that of the collector and perhaps of the sites where the altar has been exhibited." Also on Monday at 5 p.m., Tibetan scholar Geshe Lhakdor will discuss the relevance and adaptation of ancient Buddhist theory and practice to modern and diverse societies in their talk, "Mindfulness, Compassion and Secular Ethics." This event, which includes guided meditation, will be held in the Carlos Museum Reception Hall. For the remainder of the week, guided compassion meditation sessions will be held each day from 5 to 6 p.m.
On Tuesday, March 22, at 7:30 p.m. there will be a panel on "Optimizing Health Through Diet and Behavior: Holistic Perspectives from Chinese and Tibetan Medicine." Wei Huang, a Western medical doctor with a PhD in neuroscience/psychology, and Tibetan medical doctors Khenrab Gyamtso and Tenzin Namdul will speak about how these ancient medical traditions promote well-being through food choice and behavior. Gyamtso is flying in from north India for the event, while Namdul is pursing his PhD in anthropology here at Emory, notes panel moderator Tawni Tidwell, an anthropologist and PhD candidate in the Department of Religion. The discussion is sponsored by the Emory China-Tibet Initiative. "Participants will have the opportunity to identify their individual Tibetan medical constitution and Dr. Wei Huang will offer the audience some insightful dietary tips from both her research and clinical work," Tidwell says. The Currie Lecture, "Balancing Compassion, Justice and Religious Beliefs: Some Perspectives from the Buddhist Traditions," will be Wednesday, March 23, at 7:30 p.m.
"Drawing both from Buddhist philosophy as well as the historical example of Emperor Ashoka's second century BCE rule, I shall present some perspectives on how the tensions between religious beliefs and values, on the one hand, and the public space of governance and justice, on the other, are understood and negotiated in Buddhism," says speaker Geshe Thupten Jinpa. "A particular focus will be the perceived conflict between the demands of compassion and of justice." Michael J. Perry, Robert W. Woodruff Professor of Law, is the respondent. "My response will focus what seems to me to be a striking similarity as I see it between Buddhist compassion as a normative ground of political decision-making and the 'act towards all human beings in a spirit of brotherhood' imperative that, according to the Universal Declaration of Human Rights, is the fundamental normative ground of the political morality of human rights," Perry says. Sponsored by the Center for the Study of Law and Religion, the lecture is free but registration is required. On Thursday, March 24, Himalayan tea will be served at an AntiquiTEA talk by Tidwell, who will explore the origins of Tara in Buddhist narrative and meditational practice at the 4 p.m. event. "The AntiquiTEA lecture will give people a chance to learn both the familiar and rare aspects of the history, legends and iconography associated with Tara — a myriad figure who is also one of the most widely recognized, revered and practiced meditational deities in the Buddhist pantheon," Tidwell says. "Both men and woman may be surprised at how this primordial feminist may be highly relevant to their lives." As a Tibetan medical doctor, Tidwell will also discuss the medicinal formulas related to the history and role of Tara. Later that evening at 7:30 p.m., in his talk "Humble Before the Void: Teaching Cosmology to Tibetan Monks," astrophysicist Chris Impey will share the surprise, delight and mirth he has experienced through an adventure at the nexus of science, religion and philosophy and culture. The talk is sponsored by the Department of Physics and the Emory-Tibet Science initiative; registration is required. "The programs that have emerged from this synthesis of the Tibetan and Western intellectual traditions — such as the Emory-Tibet Science Initiative and Cognitively-Based Compassion Training — offer insights into a more holistic understanding of our world as well as tools for greater human flourishing," Beck says.